SEACOASTERS IN THE WILD: Rigs-2-Reefs! 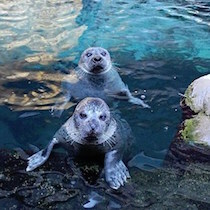 You were born and raised on the seacoast. 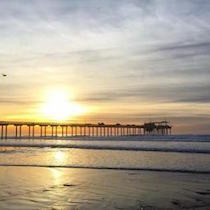 What do you love most about this special place? Besides my family and friends, I really appreciate the sense of community, the seasons, sights, and smells (and tastes, if you include the Ice House!). The Seacoast will always be my home. Growing up in New Castle and tide-pooling by the beach, I believe, is what first instilled my passion for exploring our world’s oceans. 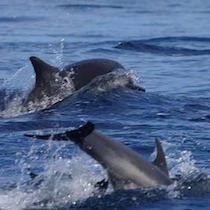 Tell us about the path of your life and how you became interested in ocean life. I have always been a water baby. 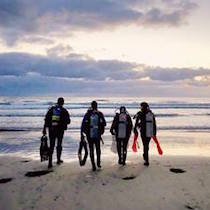 From playing around the tide pools at New Castle Beach, learning to dive, interning at the Woods Hole Marine biological laboratory, and completing my Masters degree at Scripps Institute of Oceanography, I have always felt drawn to ocean exploration and conservation. When I finished my undergraduate degree, my first job was working as a field technician on the BP Oil Spill down in the Gulf of Mexico. It was there that I witnessed first hand the destruction and devastation wrought by an oil spill. 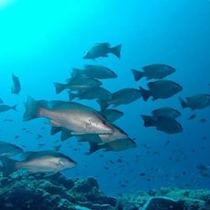 It is also where I learned of a unique silver lining to the bleak realities of offshore oil and gas development, the Rigs-2-Reefs program – a program that works to preserve the ecosystems thriving beneath the surface. 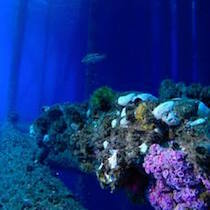 What, exactly, is Rigs-2-Reefs? When was it established? 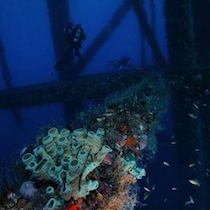 Rigs-to-Reefs provides an alternative to complete oil rig removal. 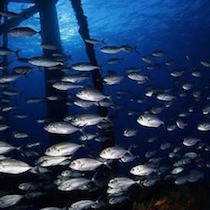 An oil company might choose to modify an oil platform so that it can continue to support marine life as an artificial reef. 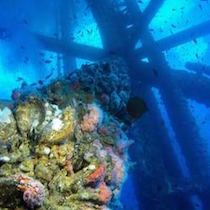 Through this decommissioning process, the oil well is capped and the upper 85 feet of the platform is either towed, toppled in place, or removed. This happens when an oil platform is no longer considered ‘productive’ and must be taken out or reefed in accordance with the law. 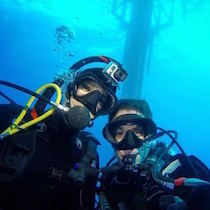 My business partner, Amber Jackson, and I began researching old rig removal for our Masters Thesis at Scripps Institute of Oceanography and it has since become the main project of our company, Blue Latitudes. 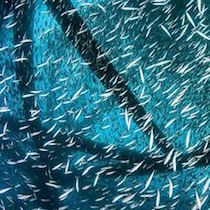 What has been the most memorable experience since being involved with Rigs-2-Reefs? The most memorable experience I have had to date (and one that never gets old, no matter how many times I dive the platforms) is the first time I rolled backwards off a boat in Santa Barbara, and plunged into the Pacific to witness my first platform underwater on scuba. Except, I wasn’t looking at an oil platform; I was looking at a living, breathing reef – one that was the size of the Empire State Building! I was stunned by how much life grew on the platform, especially considering what the platform looked like from above. The sheer size of these structures is mind-boggling (What you see from the surface is just the tip of the iceberg when you learn what lies beneath) and that feeling of awe reoccurs every time I dive a platform, whether in the Gulf of Mexico or California! 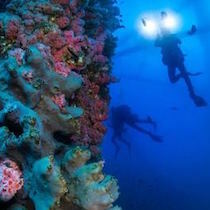 When did you scuba dive for the first time and where? 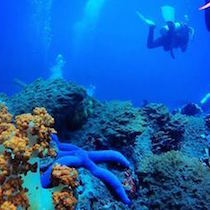 Do you have a favorite place to dive now? 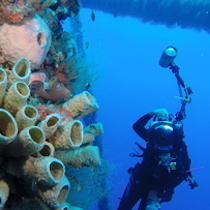 I started diving when I was 12 years old, and was certified in Honduras with my brother. 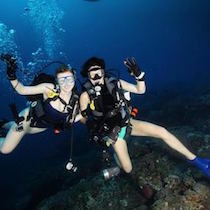 All of my family members are divers, so we took a lot of trips together exploring new areas of the ocean. Now I have over 500 dives and have moved up to dive master; diving is one of my greatest passions. I visited French Polynesia with my dad and we had the opportunity to explore an area where many of the ecosystems were untouched, which meant lots of sharks! Sharks are a sign of a healthy ecosystem. 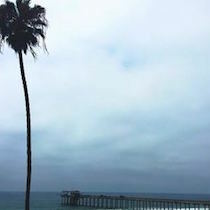 My other favorite is, of course, the California offshore platforms and the kelp forest we have here. It’s like swimming through Acadia National Park, except instead of being surrounded by pine trees, you are surrounded by kelp- up to 60 ft in length! Is your work required to take place in California? 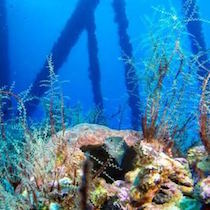 Rigs-2-Reefs is a global effort because there are oil and gas platforms in almost every ocean around the world! 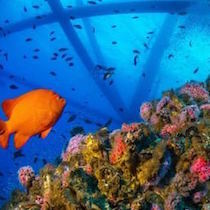 There are only three places with a Rigs-2-Reefs law – California, the Gulf of Mexico, and Brunei. 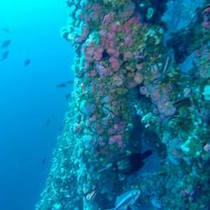 What is the importance in maintaining these artificial reefs? 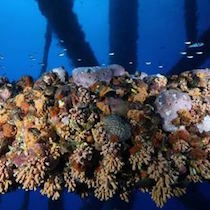 The ecosystems found on oil and gas platforms are unique microcosms of life. 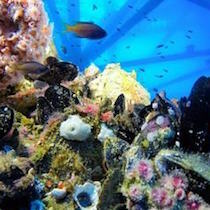 Found offshore, in a blue ocean setting, these structures offer shelter to passing sea lions and dolphins, a nursery ground for threatened species of rockfish, and a permanent residence to electric pink anemones and scallops the size of tennis balls. Each beam and column provide a habitat for life, and completely removing just one of these structures would result in the death of an ecosystem, home to hundreds of species and thousands of individuals. 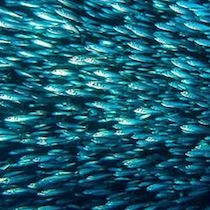 Just one platform has the ability to support over 10,000 individual fish. 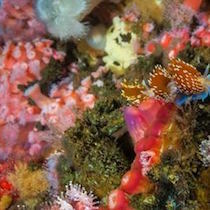 In fact, the platforms off the coast of California have been found to be some of the most productive ecosystems…on earth. 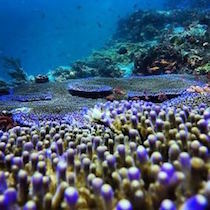 You do more than Rigs-2-Reefs and Blue Latitudes? In addition to running Blue Latitudes, our business that the Rigs-2-Reefs program falls under, I work as an oceanographic consultant to an ocean engineering consulting firm. We re-build kelp forests, run sub-bottom profiling surveys and offshore environmental impact studies, and restore lagoons! 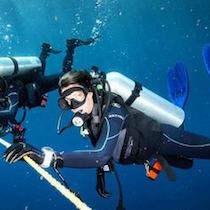 On the weekends, I also work as a dive master and shark diver for a group called SD Expeditions. Currently, my business partner and I are hard at work applying for grants and fundraising to travel to Malaysia to visit the world’s first platform to be converted into a dive-resort for eco-tourism. 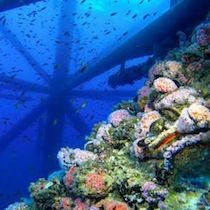 We hope to dive the platform, interview legislatures, and study the ecological, economic and cultural implications of converting a recycled oil platform into a sort of ‘ocean-minded hotel’. Ultimately, I would love Blue Latitudes to be my full-time job – to travel the world investigating and researching the implications of the program and the resiliency of our oceans. It would be fulfilling a lifelong dream of ocean exploration! Thank you for sharing, Emily, and for making our world a better place! 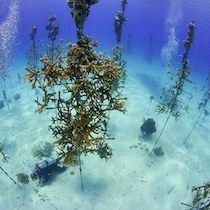 *All photos c/o of Rigs-2-Reefs!